Monsanto GMO Controversy and Cancer link to Roundup, Lawsuits Follow. July 13, 2016– San Diego, CA. Roundup weed and grass killer was introduced to the American consumer in 1976. Lawns and gardens were forever changed by the herbicide’s formula featuring the newly patented active ingredient glyphosate. The entire agricultural landscape would be forever changed merely 30 years later, when soybean seeds genetically modified to be resistant to Roundup’s powerful weed-killing properties were introduced in 1996. Genetically modified cotton and corn seeds followed in the next two years, respectively, with other varieties following soon thereafter. These new seeds were called genetically modified organisms, or GMOs. Today, much of the country’s biggest cash crops – soybean, corn and cotton – are made using GMOs that are resistant to Roundup. Roundup is being sprayed on millions of acres of farmland each year – a particularly concerning trend considering Roundup was deemed “probably” cancerous to humans by the International Agency for Research on Cancer (IARC) in March 2015. Numerous studies published in medical journals in the past two decades have also linked Roundup to a particular sinister form of cancer called non-Hodgkin lymphoma. Residue from Roundup has been found in the air, streams and rainwater of communities surrounding farmland. It has even been found in commercially sold food products, like honey, soy sauce and infant formula. As residue from the probably cancerous Roundup seeps into the soil and groundwater of communities across the nation, putting millions of people at risk for developing certain cancers, its maker is enjoying billion-dollar-a-year profits. Who is behind this apparent abomination? A corporation whose name has become synonymous with corporate evil and greed: Monsanto Company. Monsanto Company is ranked the fifth-most-hated company in America, according to the Harris Poll’s Reputation Quotient of 2016. The annual poll ranks the nation’s 100 most visible companies as perceived by the general public. Monsanto sits at the bottom of the list with the likes of Wall Street’s Goldman Sachs and Big Oil’s BP and Halliburton. Its ranking may not come as a surprise to people familiar with the company, or the bad PR that has followed it for the past decade at least. Monsanto is known for its fierce patent-protection tactics and has gained a reputation for going after the small, hard-working farmers of America (and around the world). The company wasn’t always a hard-hitting agricultural biotech firm known for effectively poisoning the world’s food supply with GMOs. No, Monsanto had a more humble beginning as a chemical company known for poisoning the world with Agent Orange and DDT. The Monsanto Company we know today is not the Monsanto Company that started in St. Louis back in 1901. Monsanto began as a chemical company, specializing in plastics, adhesives and paints. But even the original Monsanto was known for making controversial products. The first product Monsanto sold was saccharine, the artificial sweetener once believed to cause cancer. It was also a large producer of Agent Orange, the herbicide used by the US military in chemical warfare during the Vietnam War, and the cancer-causing pesticide DDT. Monsanto founded an agricultural division in 1960 and began experimenting with genetically modified plants. It was the first to genetically modify a plant cell in 1982, which gave rise to the GMO seeds we see today. The original Monsanto Company merged with Big Pharma’s Pfizer Inc. in 2000, changing its name to Pharmacia Corporation before becoming a subsidiary of Pfizer in 2003. It was in 2000 that the Monsanto we know today was born, rising like a phoenix from DDT-laced ashes. With only 16 humble years of existence as an agricultural biotechnology firm, how did Monsanto sink to the bottom of public opinion? Its persistence in protecting its patents and insistence that farmers purchase new seeds each year hasn’t helped. Being the face of a new technology that has sparked international debate regarding the safety and viability of the world’s food supply hasn’t been so helpful either. Monsanto pours billions of dollars into developing its GMO seeds. Like any technology company, it patents its products to protect against intellectual property theft. This seems logical. Until you start to realize that Monsanto isn’t patenting a phone app, it’s patenting the seeds that give life to our nation’s – and our world’s – food supply. It is patenting living organisms that have a direct impact over the lives of literally billions of people. In order to protect its property, Monsanto sends investigators into the field to find farmers who may be infringing on its patents. If it finds its GMOs in a crop yield of a farmer who hasn’t paid for the seeds, the company goes after that farmer. “Monsanto is big. You can’t win. We will get you. You will pay,” the man reportedly told Gary Rinehart, of Eagleville, Mo. “It made me and my business look bad,” Rinehart told Vanity Fair. Rinehart was neither a farmer, nor a seed dealer. He told Vanity Fair he was incredulous when the Monsanto agent barged into his store and threatened him. This is not an isolated case. Monsanto is going after farmers in rural America for patent infringement every year. “Monsanto spends more than $2 million a day in research to identify, test, develop and bring to market innovative new seeds and technologies that benefit farmers. … One tool in protecting this investment is patenting our discoveries and, if necessary, legally defending those patents against those who might choose to infringe upon them,” the company told Vanity Fair in an e-mail. Monsanto spends $2 millions of dollars a day to bring GMOs to our table, and millions more to intimidate, threaten and ultimately prosecute the farmers whose life work it is to feed America and our world. Since humans first began farming thousands of years ago, they replanted seeds produced by their crop in the next growing season. The practice of saving seeds and reusing them for next year’s crop began to dwindle in the 20th century as the popularity of hybrid seed varieties and the number of large seed distributors grew. Hybrids are created when two “true-breeding” parent seeds are crossed. While hybrid crops produce seeds for next year’s harvest, the seeds do not produce the same quality crop as brand new seeds. For this reason, farmers began to purchase new seeds each growing season. This practice accelerated when Monsanto, and other large biotech companies, began selling their own varieties of patent-protected seeds. Monsanto actually writes into its contract that farmers cannot legally reuse the seeds from a previous harvest. Monsanto also has the technology to produce seeds with “terminator genes,” meaning the seeds are bred to be sterile – eliminating the ability to reuse the seeds for another crop. Monsanto has promised to never use this terminator technology in commercial seeds. The world can rest assured knowing a company like Monsanto has “promised” not to use such devastating technology. GMOs: The Future of Farming? When Monsanto began marketing its first GMO seeds in the late 1990s, it purported the new technology was a viable solution to the world’s food crisis and would cut down on pesticide use overall. In reality, countries around the world have banned the use of GMO foods and pesticide use in the US has gone up. Around the world, 38 countries, including those in South America, Europe, Asia and Africa, have banned the use of GMOs, according to research by Sustainable Pulse. The idea that Monsanto can heroically save the world from food shortages and starvation is implausible, given the fact that 38 of the world’s 196 countries have banned their use as of 2015. That number is likely to continue to grow, not decrease. Monsanto’s claim that GMOs would cut down on the use of environmentally harmful pesticides has also proven false. The introduction of GMOs did cut down on the use of pesticides at first – that is until Mother Nature reminded us of her unmatched power. As farmers across the nation doused their Roundup Ready crops with the glyphosate-containing herbicide, the weeds it was designed to kill were building up genetic resistances to the new chemical. Now, Roundup-resistant superweeds proliferate in America’s farmlands, necessitating the use of more pesticides to control the Monsanto-created problem. Between 1996 and 2011, over 500 million additional pounds of pesticide were used on America’s farmlands because of herbicide-resistant technology, according to a study conducted by Dr. Charles Benbrook of Washington State University. The total overall increase of all pesticide used during the same time period was about 7%. Monsanto’s earnings fell 34% in its first fiscal quarter of 2016 following a year of global protests and reduced use of its GMOs by farmers around the world. In spite of this, Monsanto continues to earn billions of dollars each year off the backs of America’s farmers and consumers. Last year, Monsanto brought in roughly $15 billion in net sales. 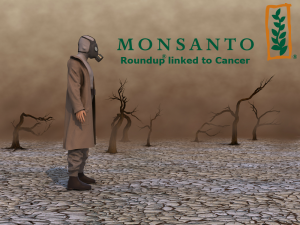 Monsanto’s herbicide Roundup has been linked to the cancer non-Hodgkin lymphoma by numerous studies published in the past two decades and was deemed “probably cancer-causing to humans” by the International Agency for Cancer Research. Still, the herbicide is used on millions of acres of farmland and by thousands of consumers in their backyards each year. Trying to take on a giant corporation like Monsanto can feel like David trying to take on Goliath. Brute force no longer wins battles like these. Today, these battles are best fought in state and federal courtrooms across the country. Armed with scientific studies, bodies of evidence and the stories of everyday people harmed by an apathetic corporation concerned more with profits than people, David can take on Goliath once again. People diagnosed with non-Hodgkin lymphoma or other forms of the blood cancer are filing lawsuits against Monsanto, the makers of Roundup. If you or someone you loved were harmed after being exposed to Roundup, you may be entitled to compensation. Call the Hood National Law Group today at 1-800-214-1010 for a free case evaluation and to speak with a member of our legal team.